Waxing is a semi permanent hair removal method. Waxing is done in almost all the parts of the body. The hair may grow back in 2 to 8 weeks, for some it may grow back within a week. It all depends on the body functions. Waxing done at beauty centers is the correct method; only thing is it should be the right beauty center. Waxing has a method to be done. If done correct, skin is maintained clean and has many benefits. Waxing can be done even at home with good practice. There are no evidences that waxing during pregnancy is harmful for mother or the child. Consult your doctor to play a safe game. 1.If you are waxing for the first time, patch test is compulsory. 2.Always apply hot/warm/strip wax in the direction of the hair growth, and pull it off in the opposite direction (i.e. : don't pull out & away from your body). 3.Always apply a thin layer of wax. The faster you can pull the wax off of your body, the less painful and more effective the treatment will be. 4.Two times is the maximum. If you don't get all the hair with two attempts, just tweeze/do treading to the remaining strays. •Take a Luke warm water bath before waxing; hot water bath will make waxing a more painful process. •Scrub your skin before waxing as the pores will open and waxing is easy, and moisturize skin after waxing will make your skin glow. 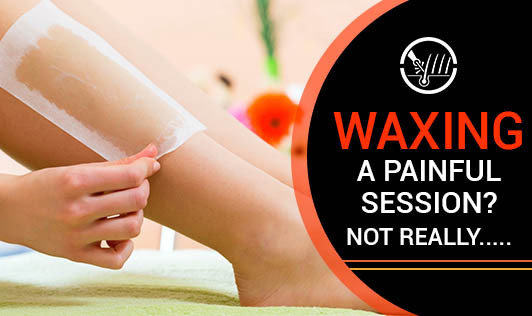 Moisturizing your skin before waxing will make the waxing process tedious. •Do not apply makeup, deodorant just after waxing. If you have a sensitive skin it can have a reaction. •Do not try sun bathe and swimming for 24 hours of waxing. Chlorine water and sun radiation can harm your skin just after waxing. •If you want a bikini wax, do not go for it when you are nearing your periods and 2-3 days after your period cycle is completed. Trim your bikini hair before waxing. Waxing may be a painful process, but advantageous. It will remove your dead skin cells and help your skin glow. Divert your mind when you are getting waxed. You will have a lovely skin. Cheers to your smooth body!